Hello! Today's card uses three sets: Lots of Letters, Stamp it BIG from Carolyn King, and Simple Hearts from Tami Mayberry. Don't they work well together? I really like how you can spell out some different beginnings or endings for the BIG greetings of Carolyn's with Lots of Letters . I kissed her small polka dot pattern from Stamp it BIG onto the bold border from Lots of Letters in Memento Lady Bug ink, re-inking each time. Isn't that fun to give this bold border any pattern you want? I love how delicate this pattern is. After stamping the border, I added the letters (one letter actually fell of the block as I was stamping so I had to make them all at slightly wonky angles to match!) and then the THANKS and "I love you" around it in Memento Tuxedo Black. I stamped Tami's hearts image and cut out to pop up at the top left and then used some Gina K Bowl of Cherries buttons and red bakers twine to finish the card. (Oh, that button on the right is covering a black smudge, hee!) Cardstock is Pure Luxury White and Black onyx. Thanks for visiting me today! It's almost the weekend, woo hoo! Here is another "no line" Copic sample I made with Stately Flowers 6 using Gina K Honey Mustard Ink and Copics R00, R22, R35, YG11, YG03, G07, and BV23 and C-3 for shadows. I cut around the side like I did on my card from Monday(scroll down to see) because I'm just enjoying that right now! I also used R22 marker on one of Gina's Tickled Pink buttons to make it a little more coral to complement and balance the darker shades of my rose in the design. I also stamped the large frame from my Branching Out set over my mat in Memento Bamboo Leaves and added some accents with a marker. This is the second time I've used the Branching Out frame with this rose and I just love how they look together! Finally, I used a quote I love from my Say it with Flowers set. It's just perfect with this blooming rose bud. Cardstock is Pure Luxury Innocent Pink, Black Onyx and White. Hope this inspires! I love pink roses! from our Design Team Bio pages. Good morning! Today I wanted to show some of the buttons I picked out from the Bowl of Cherries button assortment, which coordinates, of course, with the Gina K Cherry Red ink pad and cardstock, as well as blending with our other red and pink inks and cardstocks! I was so excited when my packs arrived to see all the beautiful variety in color shapes and sizes ans well as the beautiful dyed to match! As you can see, some have glitter, and many look very different on the front from the back, matte vs. shiny, flat vs. bumpy, giving you even more options which look you are going for. Even some for threading your ribbons! I also really like that you can find oval or square buttons (or even a heart or a flower?) when you rally want to repeat that shape form other parts of your design. Stay tuned for a peek of another gorgeous colored assortment. Thanks SO much for all your sweet comments about the Stately Flowers 6 and Birds and Blossoms mix and match I did! Gina tells me quite a few of *both* sets were purchased later that day. ;) I wanted to share another idea I had for combining these two sets, as Theresa's butterflies are sized just right for my mountain laurel bunch! So here is another mash up, hope it inspires! I decided to do the "no coloring" method again for stamping and coloring my flowers, but did less shading and kept my strokes looser and less blended for a more water-colored, Impressionistic look. Stamp the flowers first in Gina K Honey Mustard (I actually stamped it off to make it even lighter) and then color. Stamp butterflies over it in Tuxedo Black and color. Copics: R05, R22, R35 for the flowers and butterflies, and YG11 and G07 for the leaves. BV02 for the shadow. Last I stamped this greeting from Carolyn's Stamp it BIG in Gina K Red Hot ink, and then shifted the stamp and stamped again without re-inking (stamping off) to create that peachy color to match the shades in the flowers. To add some interest, I decided to do a cut away on one side of my rectangle mat and just love how it turned out! Just going around one side like this, and not cutting up to the actual edge of the image itself makes the card so much more special but isn't as time consuming as fussy cutting the entire thing! If I had to do this card over again, I would stamp on White cardstock, instead of Ivory which you see here. I just happened to have a piece of ivory on my desk ready to go at the time, AND I thought I was going to keep a warm color scheme. It still works with the cool Turquoise, but white would be that much sharper/brighter /cleaner. Just sayin'! Have a wonderful day! Gina will be featuring Stately Flowers 6 in her StampTV video on Wednesday (and Birds and Blossoms on Friday) and I can't want to see what she has in store! Glad you are all enjoying the new stamps! *Well, actually he said "greenish-blue", but that translates to Pure Luxury Turquoise Sea to me! He's a Gina K fan, too, but does not know all her cardstock colors by name, hee! Mix and Match Gina K. Blog Hop! with the illustrating team mixing it up by pairing some of our new sets! Comment on each of the blogs and you could win a huge bag of Gina K. Designs stamps, patterned paper and embellishments, courtesy of Gina K!! The realistic nature images in Stately Flowers 6 and Birds and Blossoms are a match made in heaven! Pine branch and pine cone are stamped with Gina K. Dark Sage. This pad (or Fresh Asparagus) is perfect for stamping this branch so the needles are already green, no need to trace with color. Pine cones are colored with Copics E43, Y28, E57. I sponged the edges with Gina K. Ocean Mist. Bird is stamped in Gina K. Honey Mustard and colored with Copics E43, Y28, E71, C-5 and E49 (this last color really making the bird spring to life on the tip of the beak and around the eye, which gave him a little spark). These pads are great for line art and Copic coloring and I am loving this shade for the bird, the "no line coloring" showing just enough detail to show you were the color should go, but enough to recede so you see the form but not the outline. Cardstock is Pure Luxury White, Ocean Mist and Dark Chocolate. While I didn't take step by steps of the coloring, I am recreating for you how simple it is to build out the scene for the bird to perch! Here is the large pine branch stamped and turned, re-inking each time. Add in the smaller pine cone. No need to try to mask those needles, they could be in front, so just stamp right over. Sponge the edges, and the scene is complete! Just color in the cones. And here is a new way to use Debbie's Skater Diva, how about a Roller Diva?? Just cut off the blades after stamping and add brads. You can even put a little dot on each for the axle. I also used Tami's Simple Hearts for the greeting and punched X O embellishments to mimic the wheels. That's how I roll...! With Carolyn and Becky's sets, the big SMILE is just perfect with the little Polaroids! Be sure to pop up a few to add dimension! You can stamp directly onto your photos and then cut them out like you are paper piecing, or here I just reduced them down to the same size opening as the photo window and printed them out to then cut and add. These little moment/memories form the past of my boys' real photos (I made this card for their proud uncle) just melt my heart! I hope you enjoy the rest of the hop and are inspired by how wonderfully our Gina K stamp sets work together! Melanie Muenchinger-illustrator Stately Flowers 6-you are here! CardMaker May Arts Blog Hop! Good morning, and welcome to a ribbon-tastic blog hop with the CardMaker team and our designing friends, sponsored by May Arts! May Arts will be giving away four spools of the winner’s choice! 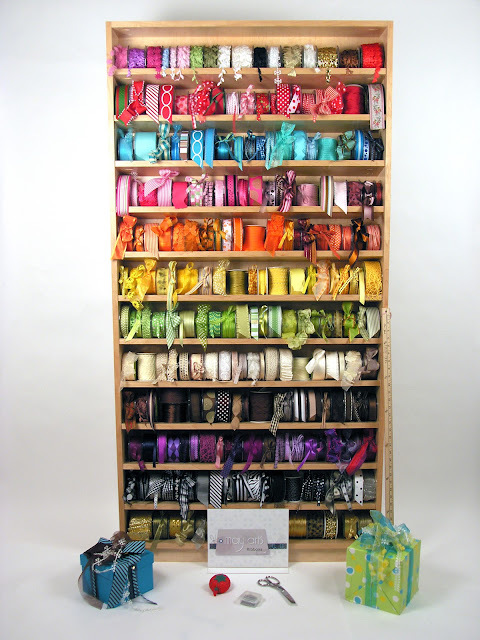 Leave plenty of comments along the way while you hop today to enter to win a prize of 4 spools of ribbon – your choice! And that includes anything from their Winter 2013 New Releases! These are so new they aren't even listed on their website yet. So you'd be the one of the first to get your hands on 'em! Giveaway details can be found on the May Arts blog. I had some really fun choices of ribbon for my sample today! I decided on this adorable green and white grosgrain with a printed stitch and scalloped edge. The detail of the tiny punched holes in the scallop is just amazing! Little finishes like this on trims really take your designs to another level. Supplies used: 5/8" green scalloped grosgrain 426-58-46 ribbon by May Arts, White and Black Onyx Pure Luxury cardstock, Stately Flowers 6 and Stamp it Big stamp sets, Gina K. Mixed Greens buttons, and Fresh Asparagus ink pad from Gina K. Designs; Memento Tuxedo Black ink pad from Imagine Crafts/Tsukineko; Copic markers YG11, YG03, BV31; and foam dots and EZ Runner permanent adhesive from Scrapbook Adhesives by 3L. Thank you, May Arts, for sponsoring today! Now please make your way to the fabulous blog of Monica Edwards! Here is the full link list, lots of peeps participating today, don't want to miss a post! Thank you for visiting me, and enjoy the rest of the hop! Had to point you towards a gorgeous example for Copic coloring, stamping and card design from the amazingly talented Christine Okken, my new stamping friend and fellow CardMaker blog team member! 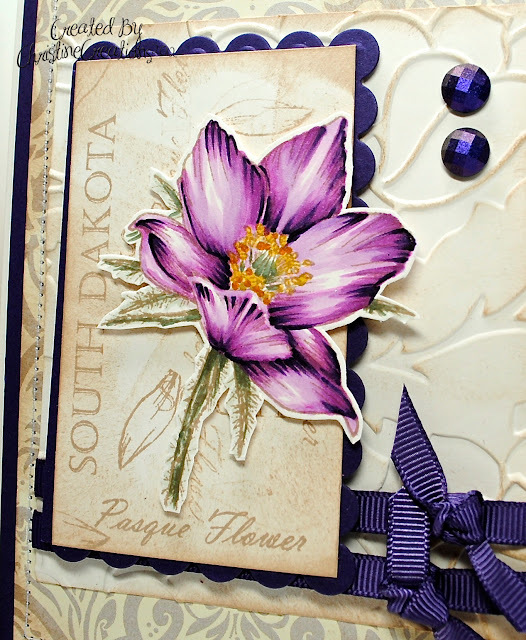 I about passed out when I saw how beautifully she colored this Pasque flower from Stately Flowers 5! While I've used lighter inks to stamp line art for more subtle look, I haven't used this particular color before. Please see Christine 's blog for full creation details and copic colors! Some fun hops this week, one with my CardMaker team tomorrow (and a giveaway), as well as something fun and new with our Gina K. Designs illustrating team on Thursday! Can't wait! For my sample, I thought it would be fun to use Becky's glasses from Spoon Me for the top half of a hinged card, the way you raise your glasses, you know?) and then have the reveal of the vision chart when opened. Pattern is created with Tami's new Simple Hearts set. You can all find examples of all these in our STV gallery for inspiration and construction, Gina has even done a few videos! Whether you choose to create a design that is your favorite to make, one you've been wanting to try, and begin with an image you want to set in motion, I can't wait to see what you make! Have fun! Quickie post: Here is another card I made with one of Debbie's Darling Divas, Scooter Diva! Isn't she sassy? This card is a little smaller than A2, and I have to say, it kind of freshens things up to work in a little different scale once in awhile! To create pattern, interest and motion on this card I stamped my chevron border from Pretty Patterns. Aren't they fun together?! This is an old SU! blue pad I used which is drying out so I don't have perfect coverage, made it *before* I received my new Gina K pads! :) Cardstock is Pure Luxury White and Black Onyx, and I added some small adhesive rhinestones to the wheels. Image colored with Copics. Have a terrific weekend! Gotta gooooooooo! Good morning! I have a post up on the Cardmaker Blog today sharing a great technique for some of our newest stamp sets released this past week from Gina K. Designs. Good Morning! The Design Team for Gina K. Designs welcomes you to the final day of our fabulous Inspiration Blog Hop for January! Gina and the Design Team will inspire you with many beautiful ideas for our newest sets, and as you hop through their blogs, make sure to leave a comment on each of them because we will choose a few random comments and those stampers will each win a grab bag of Gina K. Designs products! To see the full list of winners, check the Big News forum at Stamp TV a few days after the hops. Today we have the Gina K Designs Free with Three set, Sweet Tweets, what a cutie! This set is free this month ONLY, when you purchase any three sets valued at 19.95 or more (three singles or duos each count as one set) I made a fun birthday card with the adorable cupcake, bending my greeting around the top, and bending the birdie banner below to frame my die cut oval, don't you love the flexibility of clear stamps? Cardstock is Pure Luxury White and Powder Blue, ribbon is the Red Hot double stitched Pure Luxury in both widths and a Gina K blue Singing the Blues button accent! Background embossed with CB Seeing Spots folder. And finally introducing our newest illustrator Debbie Corbari's line of Darling Diva stamps! Well, when I saw Debbie's cute images and this very focused girl in tree pose in "Balanced Diva", I just had to come up with something super silly, don't some days feel like this?! Or that you could find that kind of balance? (*This* balanced would be a really superb day, no?) I pieced her little yoga outfit ( Chevron DP is from the GKD patterned paper pack) and colored with Copics, added a little shadow under her bun with W-3. I decided to put the white mat behind a circle cut out, kind of like the yin and yang but not as literal, and add some buttons, balancing, of course! Scooter and Skater Divas later in the month. Stately Flowers 6, Now Available!